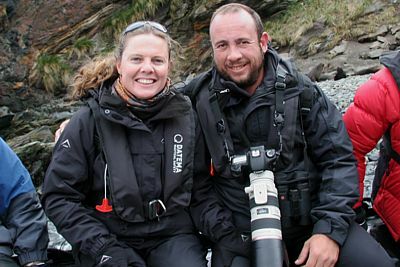 Having been approached by my friends at Rockjumper Birding Tours (www.rockjumper.co.za) to join this trip and act on their behalf as a birding guide for the trip, it really did not take a lot of consideration on my part. 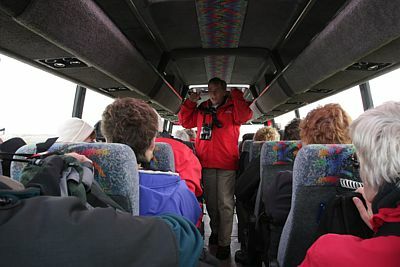 With an opportunity like this, there was no way I was going to pass it up, so I happily accepted the offer and then arranged for my wife, Margaret, to join the trip as a passenger as well. 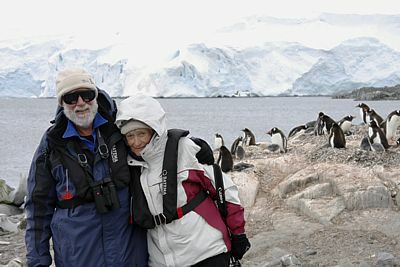 It wasn't too long before our friends, Alvin and Flick Cope, decided to join the trip as well and, before we knew it, we were hitting the shops and buying all the necessary polar equipment that we would need for this dream trip. 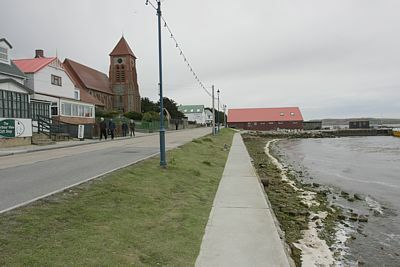 Situated about 560km off the east coast of South America in the south Atlantic Ocean, the Falkland Islands consist of two main islands with 776 smaller outlying islands included as well. 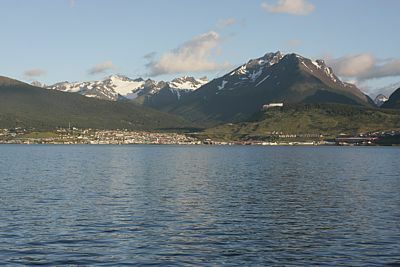 With an area of just over 12 000 km2, it is not terribly densely populated either with the total population estimated at just over 3 100 people, of which about 2 100 people live in and around the capital, Stanley. 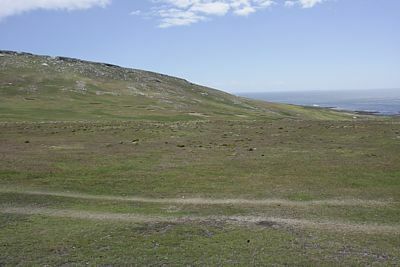 Generally, the main islands are fairly mountainous, except in the south of East Falkland where there are more low-lying and undulating landscapes. 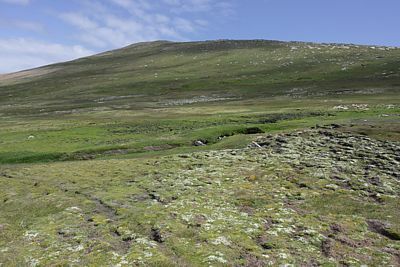 The highest point is Mount Usborne at 712m. 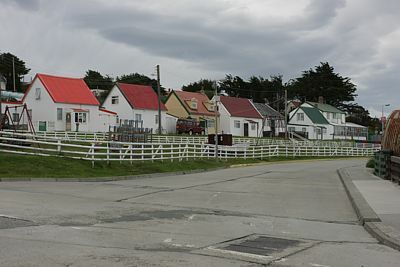 The islands have been claimed as a British Overseas Territory since 1833, but this is not specifically recognized by Argentina (who call the islands Islas Malvinas) and has been the reason for wars in the past. 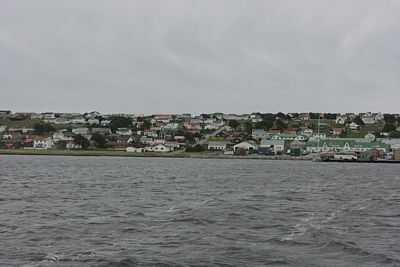 About 1 390km east-south-east of the Falkland Islands lies South Georgia deep in the southern Atlantic. 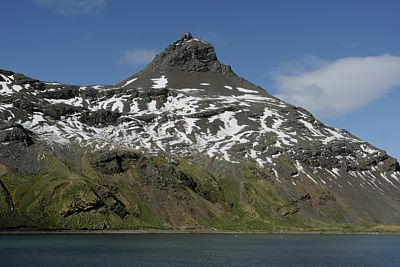 Together with the main island which is about 167km long and varying in width between 1,4km and 37km and several smaller outlying islets, the total area of the group is just over 3 700km2. 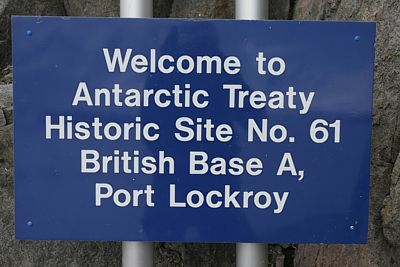 Like the Falkland Islands, it is claimed as a British Overseas Territory together with the South Sandwich Islands and Argentina (who call the island San Pedro) do not specifically recognize this also claiming the islands as their own. 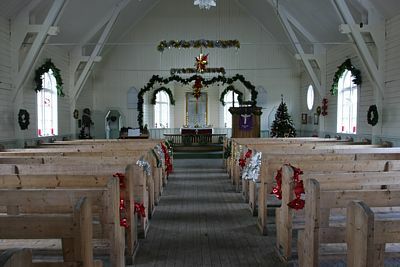 There are no native inhabitants of the island, but there are some British Government officials as well as scientists and support staff based at the capital, King Edward Point, as well as some museum staff at nearby Grytviken. 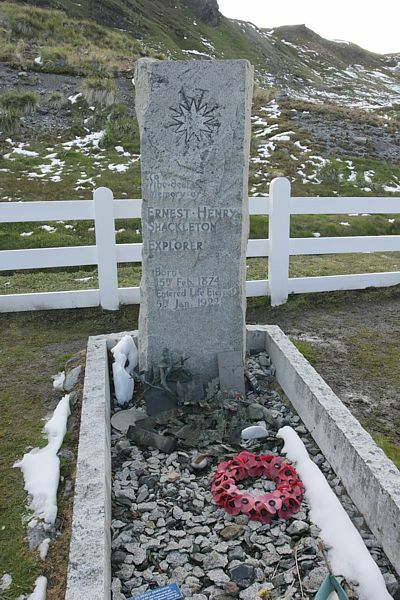 Grytviken is also home to the final resting place of well known explorer Ernest Shackleton. 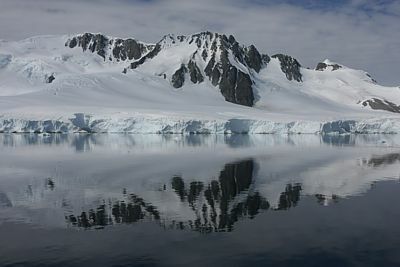 Antarctica needs no introduction and is the world's southernmost continent also occasionally known as “the white continent”. 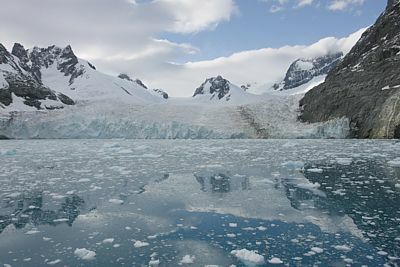 At around 14 million km2, it is the 5th largest continent and about 98% of it is covered in ice averaging about 1,6km thick! 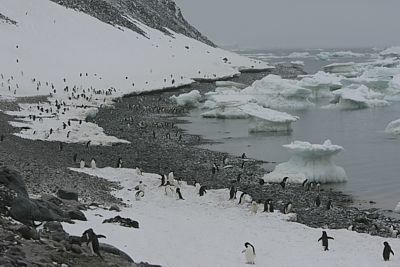 With an annual precipitation of around 200mm at the coast and a lot less inland, it is actually considered a desert and is the coldest, driest and windiest continent on earth. 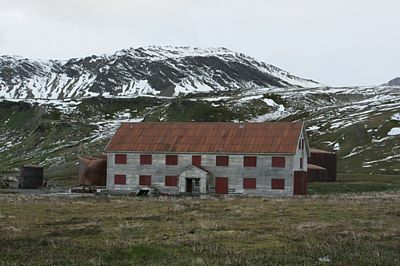 There are no permanent inhabitants on the continent but, at any one time, there may be between 1 000 and 5 000 people residing there, mostly involved with some sort of research. 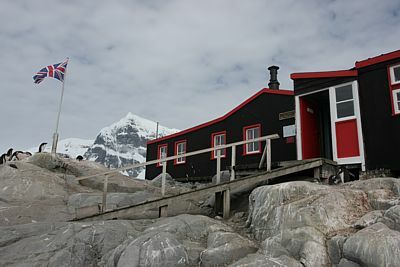 The highest point on the continent is Vinson Massif at 4 892m. 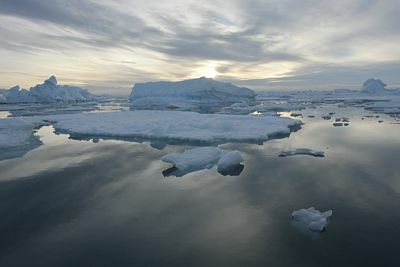 The continent also holds the record for the coldest natural temperature ever recorded on earth – a staggering -89,2 deg C at the Russian Vostok Station on 21 July 1983! 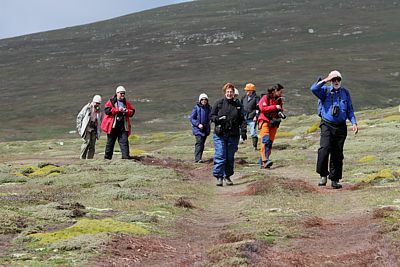 The Falkland Islands currently have a bird list of about 195 species recorded within the territory which includes 2 species classed as endemic – Falkland Steamer Duck and Cobb's Wren. 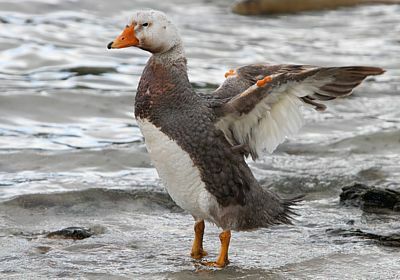 There are also a number of subspecies of birds that also occur in South America that are endemic to the islands. 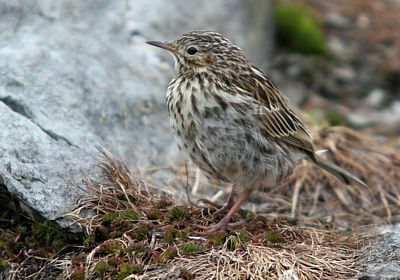 South Georgia has a somewhat lower list of birds with around 50 species recorded with only one true endemic, the South Georgia Pipit and one endemic subspecies, the Yellow-billed or “South Georgia” Pintail whilst Antarctica brings up the rear with a total list of 47 species, again with only one true endemic, the Emperor Penguin and a second breeding endemic, the Antarctic Petrel. 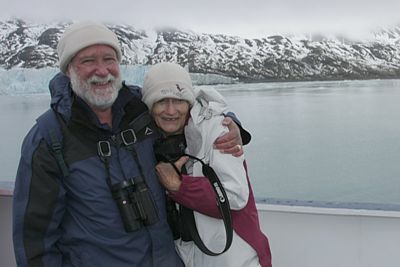 Typically, birding on the various landmasses is quite easy with most of the birds being fairly approachable, but birding in the open ocean between them can be a little tough depending on the conditions. 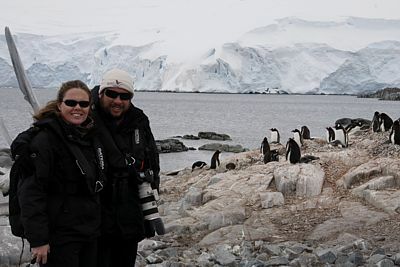 Unfortunately, due to the route of our trip, we were never really in any of the right areas to stand a chance at the Emperor Penguin, but it certainly gives one a good enough reason to go back! 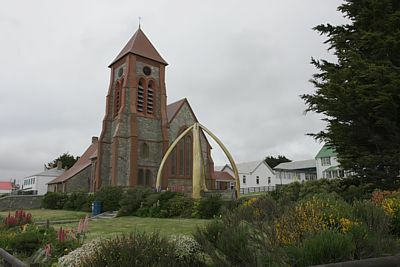 The Falkland Islands has a total mammal list of 28 species. 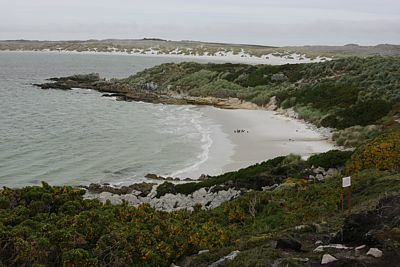 Of these, the only endemic, the Falklands Wolf, is now extinct and, apart from the Mexican Free-tailed Bat, the rest of the list is made up of cetaceans (whales and dolphins) and pinnipeds (seals and sea lions). 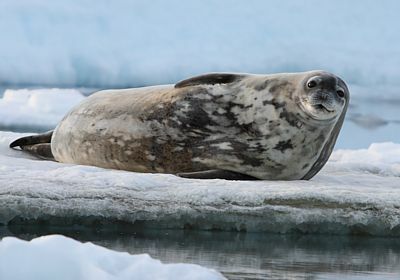 There is not a lot of information (that I could find anyway) available on the mammal list for South Georgia, but it certainly seems to be in double figures and also consists entirely of cetaceans and pinnipeds except for one introduced species, Reindeer. 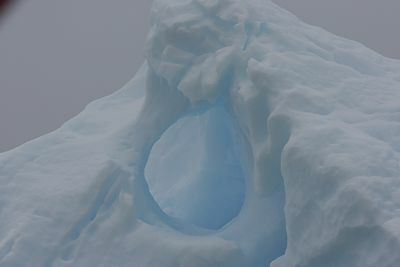 Antarctica's mammal list of 17 species is also made up of the same groups and, once again, our route was not going to get us into the right areas to have a chance at Ross Seal, another good reason to go back. 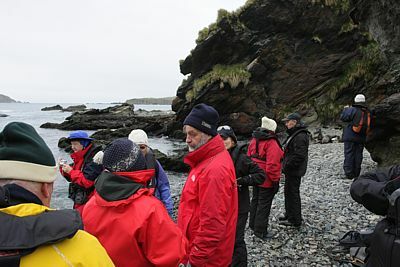 Pinnipeds were generally quite easy to see throughout the trip and we had lots of close encounters with them. 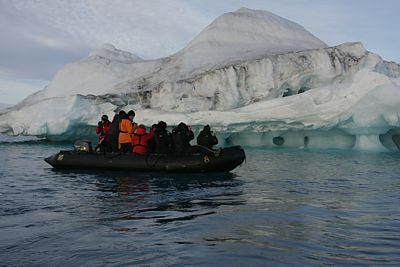 On the other hand, building up a large list of cetaceans involves a lot more luck than anything else and, often, like was the case on this trip, brief glimpses of an animal in the water are not always enough to conclusively identify them and so you have to let a lot of your sightings go. 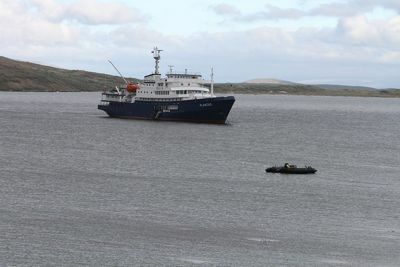 Our trip was to take place on the maiden voyage of the MV Plancius, a recently refurbished and reflagged ship operated by Oceanwide Expeditions (www.oceanwide-expeditions.com). 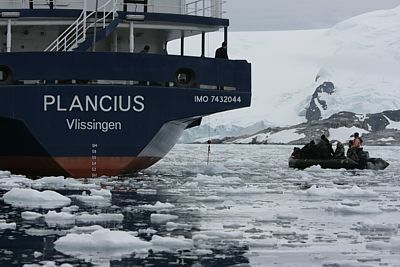 Plancius was named after the Dutch astronomer, cartographer, geologist and vicar, Petrus Plancius (1552 - 1622). 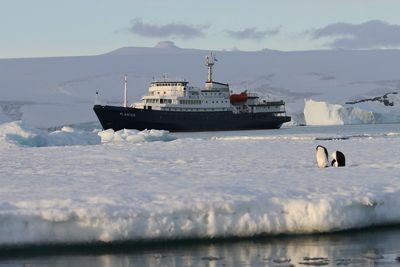 She was built in 1976 as an oceanographic research vessel for the Royal Dutch Navy and was named Hr. 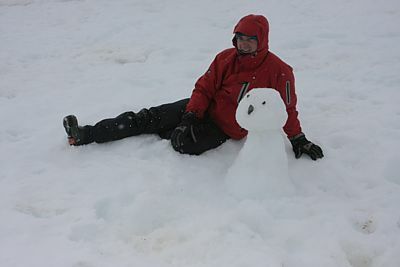 Ms. Tydeman. 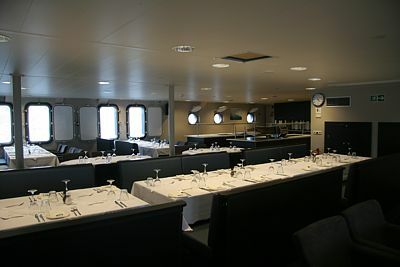 The ship sailed for the Dutch Navy until June 2004 when she was purchased by Oceanwide Expeditions and was completely rebuilt in 2007 and converted into a 110-passenger vessel. 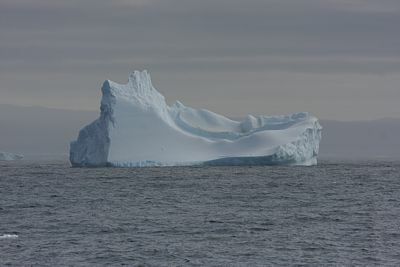 She is 89m (267 ft) long, 14.5m (43 ft) wide and has a maximum of 5m (15 ft) draft with an ice strength rating of 1D. 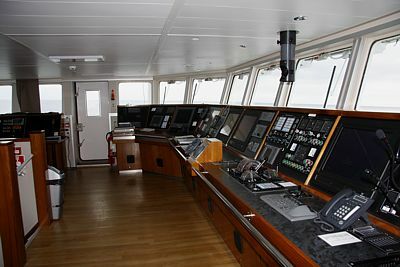 Top speed is 10-12 knots with three diesel engines generating 1230 HP each. 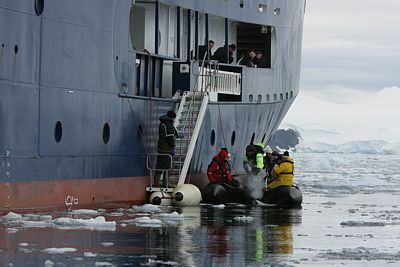 One is always a little nervous when embarking on the maiden voyage of any particular vessel, particularly to some of the remotest places on earth, but as it turned out, everything went off reasonably smoothly. 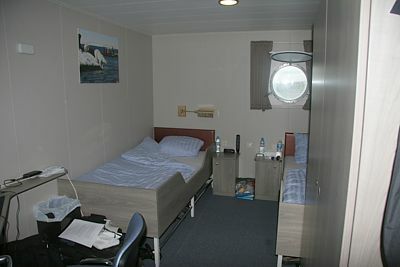 Conditions aboard the ship were more than comfortable. 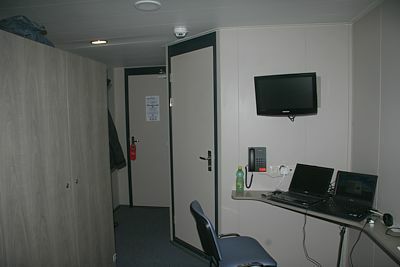 The cabins were well appointed and had all the necessary facilities. 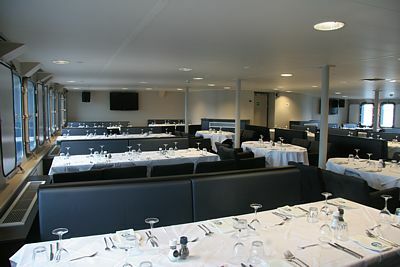 The dining room was spacious and never really felt overcrowded at any point. 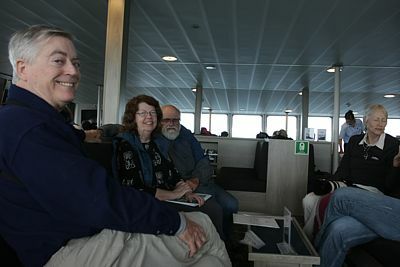 There was a great observation lounge on one of the upper decks with large windows all around where we spent a lot of time when the weather outside was less than desirable. 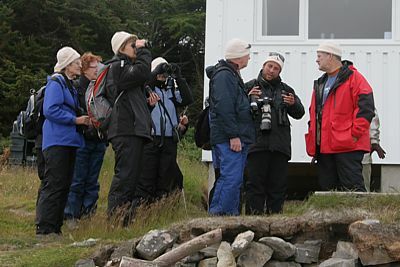 Outside deck space was also great and there were many options to choose from when trying to find the best place for birding. 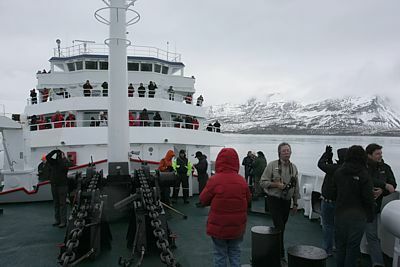 Currency aboard the ship was supposedly in Euros, but they were also happy to accept US Dollars. 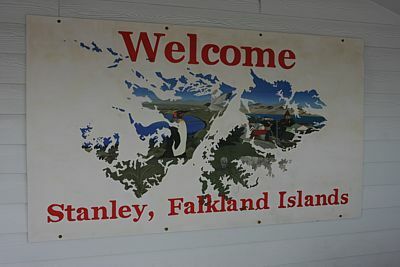 In the few places where we could buy things on our landings, they were also happy to accept either of the above currencies, although, in the Falkland Islands, they do have their own currency, the Falkland Pound. 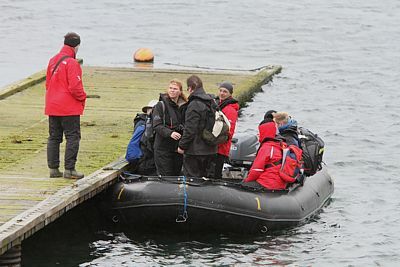 Medically speaking, there were no real precautions to take apart from trying to combat sea sickness. Obviously, this affects different people in different ways and there are so many different recipes for trying to deal with it that I won't even contemplate trying to cover them here. 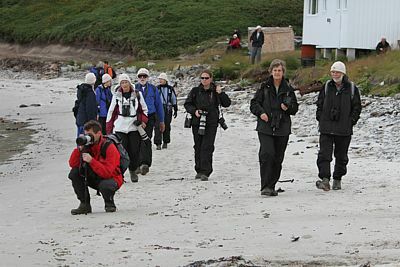 Although I was the bird guide for the group that had been booked on to the trip through Rockjumper Birding Tours (www.rockjumper.co.za), the operators also provided several guides on the trip who expertise ranged from wildlife through to the history of the area. 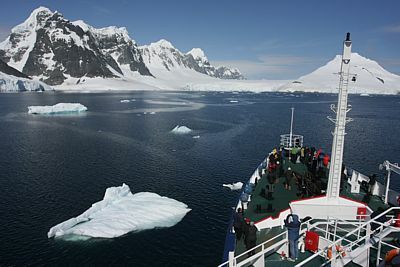 The hotel staff on the ship were extremely friendly and efficient and, generally, most of the crew did a good job too. 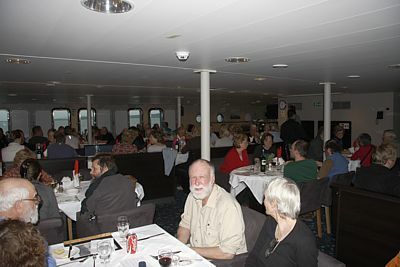 After dinner, many of us were back up on deck to bird the last hour or two of daylight. 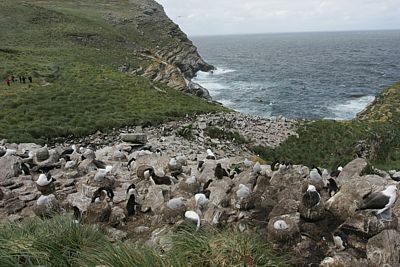 Although there were good numbers of Chilean Skuas and King Shags, tubenose numbers were still low with only Black-browed Albatross and Sooty Shearwater being regularly seen. 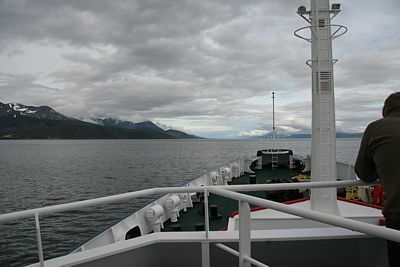 We woke up early to find ourselves at the mouth of the Beagle Channel. 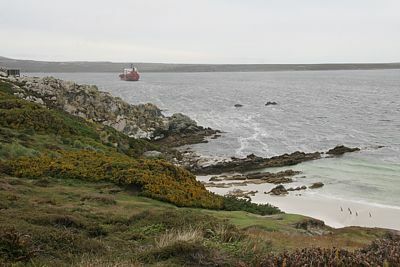 The day would be spent at sea heading north-east towards the Falkland Islands. 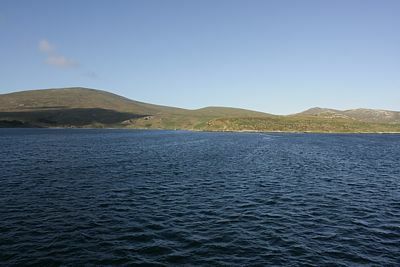 Our first day at sea was absolutely fantastic with bright sunny conditions, no wind to really speak of and a flat calm sea! 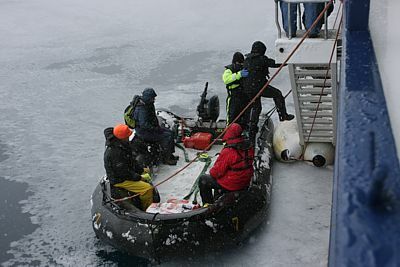 Apart from eating meals and attending some briefing sessions, most of the day was spent on deck scouring the open ocean to see what we could find. 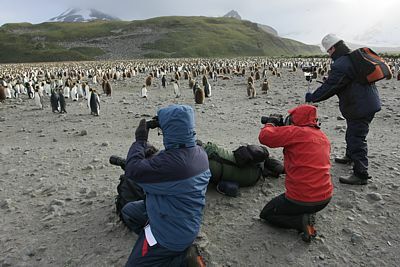 We saw reasonable numbers of birds throughout the day including Wandering, Northern and Southern Royal and Black-browed Albatrosses, Southern and Northern Giant, White-chinned and Cape Petrels, Great and Sooty Shearwaters, Slender-billed Prion, Wilson's, Black-bellied and Grey-backed Storm Petrels and Magellanic Diving Petrel whilst the mammals included South American Fur Seal, Fin Whale and a small pod of Peale's Dolphins. 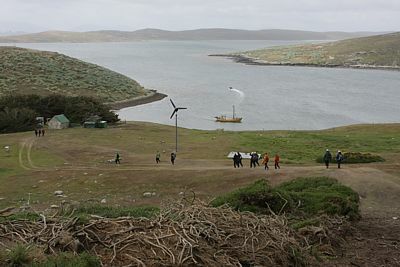 We woke up to find ourselves anchored off Westpoint Island in the Falklands and, once up on deck, we had birds like Black-browed Albatross, Southern Giant Petrel, Subantarctic (Brown) Skua, South American Tern and Kelp and Dolphin Gulls all around the ship. 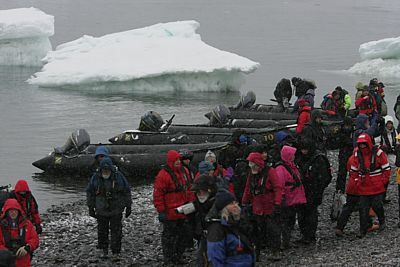 After breakfast, we undertook our first zodiac landing of the trip to land at Westpoint Island. 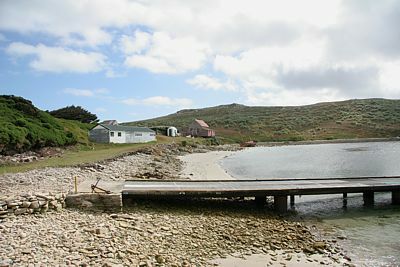 Fortunately, this one was fairly timid with calm conditions and a nice jetty to land at. 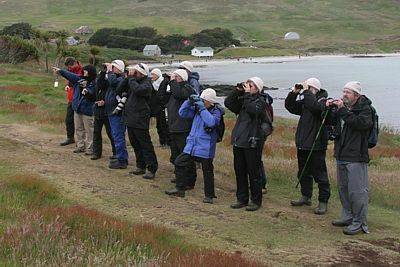 Almost immediately, we encountered our first land birds including Upland and Kelp Geese, Blackish Oystercatcher, Turkey Vulture and Striated Caracara whilst our first Falkland endemic, Falkland Steamer Duck, was also collected. 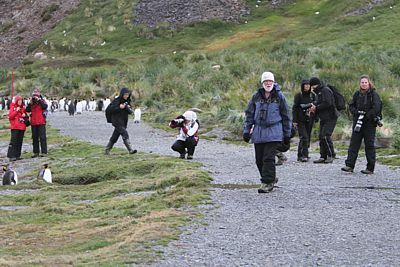 A long walk across the island added things like Dark-faced Ground Tyrant, Long-tailed Meadowlark, Black-chinned Siskin, Austral Thrush and Correndera Pipit before we finally arrived at a breeding colony of Black-browed Albatrosses and Western Rockhopper Penguins situated on a rather steep rocky cliff (the area that the colony was in was known as Devil's Nose). 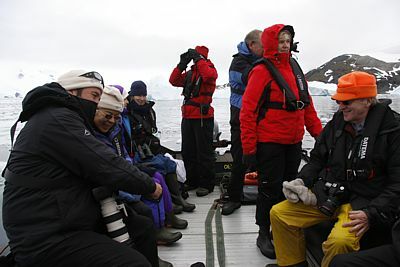 After spending some time at the colony and taking full advantage of the photographic opportunities, we made the long walk back across the island to the jetty and took the zodiacs back across to the ship before heading off to lunch. 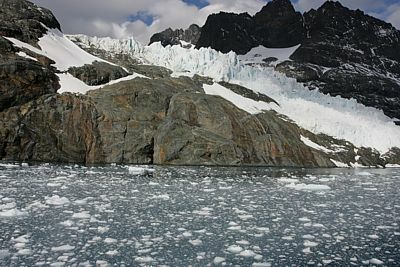 Whilst we sat in the dining room enjoying lunch, the ship then repositioned herself to Carcuss Island and, a couple of hours later, we found ourselves on the zodiacs once again, landing at Carcuss Island. 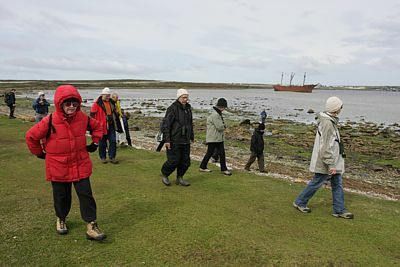 A walk along the coastline here gave us many of the same species we had seen earlier, but added things like Blackish Cinclodes, Magellanic Oystercatcher, Black-crowned Night Heron, Ruddy-headed Goose, South American Snipe, White-bridled Finch and the second of the Falkland endemics, Cobb's Wren, meaning we had a clean sweep of the endemics. 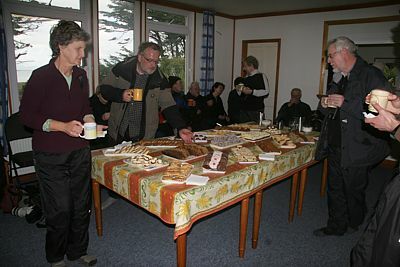 After a few hours of birding, we were all invited to the home of one of the locals who had prepared tea and a spread of note for us - lots of cakes and other sweet things which kept us all very happily engaged for some time. 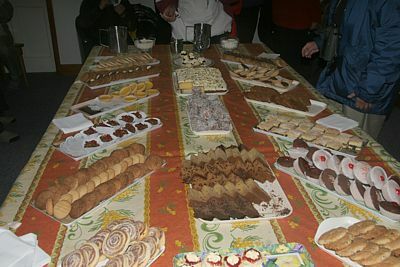 In fact, I am sure many of us could have stayed there a lot longer just enjoying all the delicious treats that were on offer! 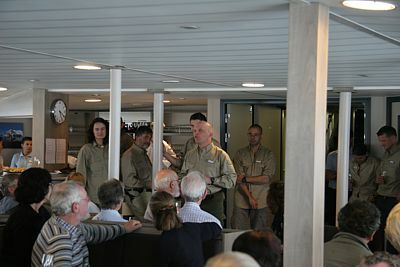 It was finally back to the ship again after a very successful day. 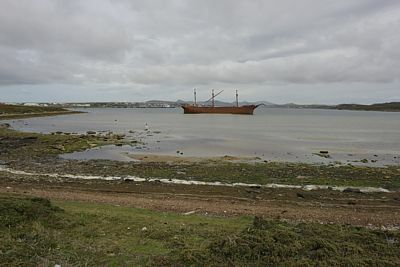 We awoke early this morning to watch the ship sail into Port William harbour through The Narrows and eventually anchor off Port Stanley, the capital of The Falklands. 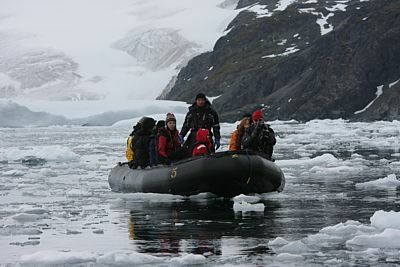 After breakfast, we all climbed on to the zodiacs and made our way across to land. 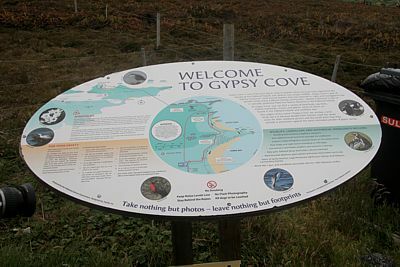 We were met at the landing site by a couple of tour guides from Falkland Islands Tours & Travel who then escorted us into busses and took us one a short tour of the area via the wreck of the Lady Elizabeth to eventually end up in Gypsy Cove. 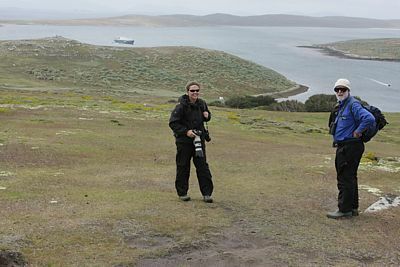 Birding along this tour turned up Magellanic Penguin, Upland Goose, Two-banded Plover, White-rumped Sandpiper, Crested and Falkland Steamer Ducks, Long-tailed Meadowlark, Correndera Pipit and Black-chinned Siskin whilst a small pod of Peale's Dolphins were also present at Gypsy Cove. 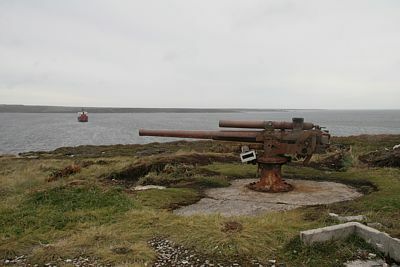 One thing that we also noticed in this area was a lot of signs of the 1982 Falklands war - there were still numerous canons around as well as many signs warning of potential danger with mines. 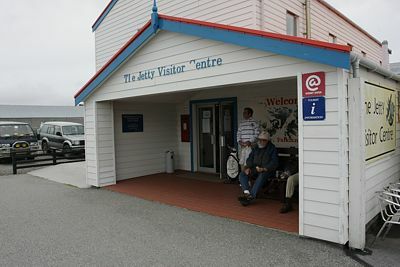 We then headed back into the town where we picked up a packed lunch and relaxed at the visitors centre with Dolphin Gulls looking on. 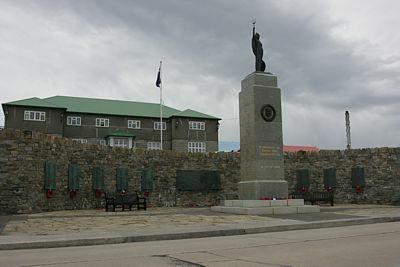 The rest of the time was spent wondering around the town visiting various sites (including the war memorial), doing the "tourist thing" at several souvenier shops and also taking in the local tea and scones at a friendly coffee shop. This was also the only time on the entire cruise where we encountered House Sparrows (not that they were high on our priority list!) 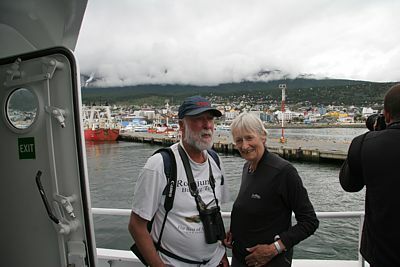 and luck was also on our side when we found Commerson's Dolphins swimming close to the harbour. 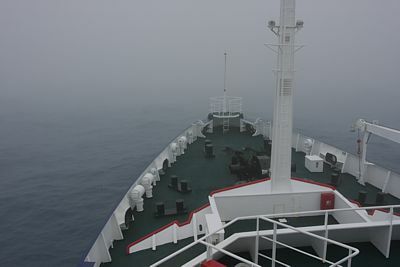 Waking up early this morning, it was good to see that the fog had disappeared, but so had the calm seas... As the day progressed, the weather conditions got progressively worse and worse and, by early afternoon, we were in the middle of a Beaufort Force 9 storm! 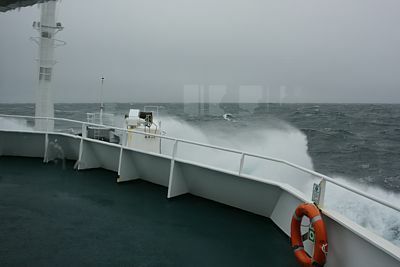 When the wind reached 50 knots, the captain closed off all outside decks and everyone was restricted to inside the ship. 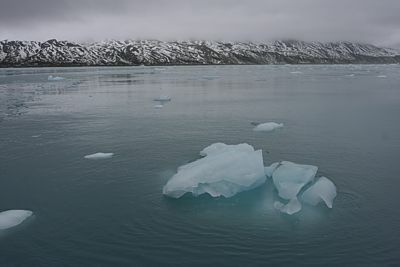 The ship was rolling quite a bit, but the captain had slowed our speed down substantially (4 - 5 knots) and also turned us into the wind which improved the ride a bit. 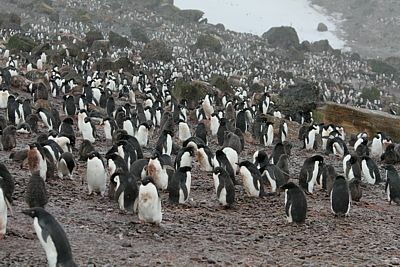 Needless to say, there weren't quite as many people up and about today due to the conditions and, during meal times, the dining room seemed remarkably empty! 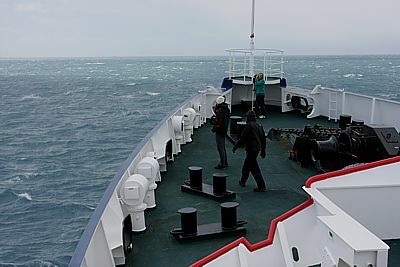 It was also a day that saw several passengers get thrown out of their chairs due to huge waves rocking the ship unexpectedly (fortunately, nobody was seriously injured) while there was also the constant sound of crockery being smashed as it rolled off the shelves, etc. 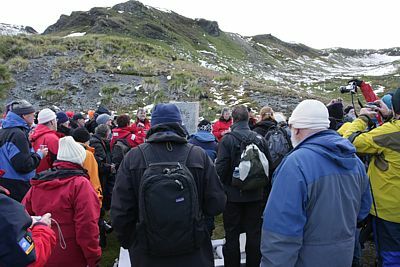 For those of us who were able to survive the conditions, the birding, confined to inside the ship, was also a little difficult, but we did manage to see many of the same things as yesterday with the additions of Wandering, Southern Royal and Grey-headed Albatrosses and a brief Atlantic Petrel. After a rather interesting night rolling around in bed, we woke up this morning to find that the storm was still with us. 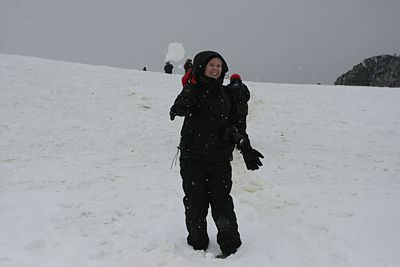 Attempting to take a shower while being rocked all over the place was a rather interesting experience... 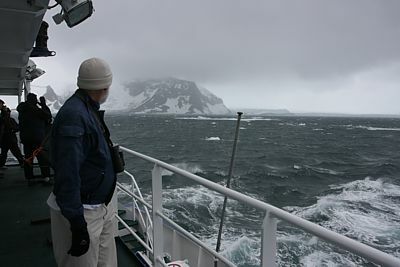 Most of the day was spent inside in the observation lounge scanning the stormy oceans to see what else we could find. 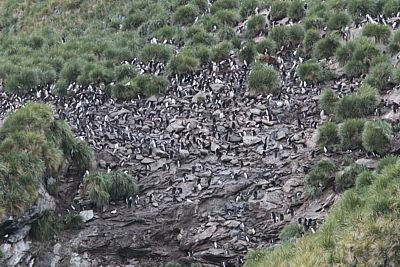 Again, most of the same species as the last few days were seen, but we managed to add Soft-plumaged and Kerguelen Petrels, Subantarctic (Brown) Skua and Light-mantled Albatross to the list and it was good to also see things like Cape Petrel and Slender-billed Prion again while a small pod of Hourglass Dolphins also provided some entertainment during the day. 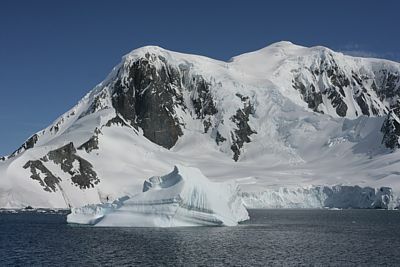 In theory, we should have been arriving at South Georgia today but, due to the weather, we had lost almost a full day and now would hopefully reach there tomorrow. 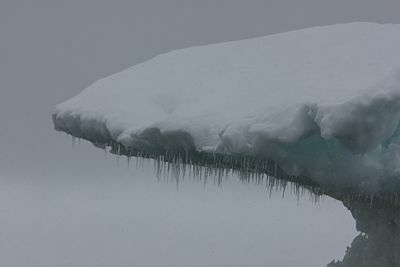 Image of low pressure cell over Scotia Sea - the reason for the big storm! 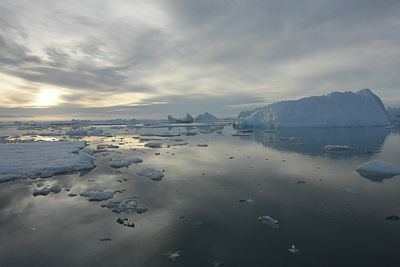 What a pleasure it was to wake up this morning and find that the seas had calmed down substantially. 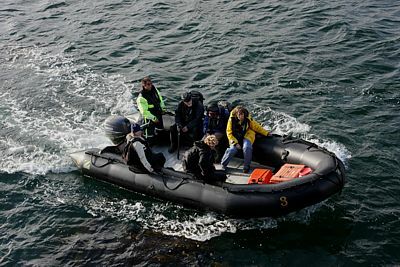 Early morning entertainment was provided by a small pod of Killer Whales that came right in to the ship and began to bowride with us. 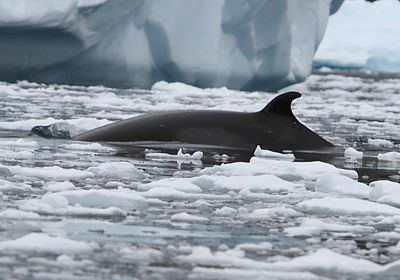 Interestingly, these were Ecotype B Killer Whales, ones known to only really inhabit inshore waters. 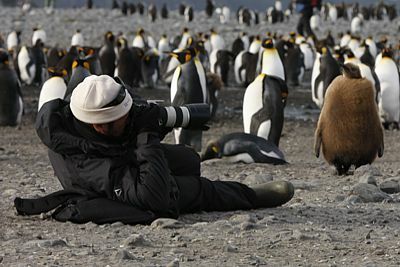 They are a lot browner than the stock standard black and white Orcas that most of us are used to seeing. 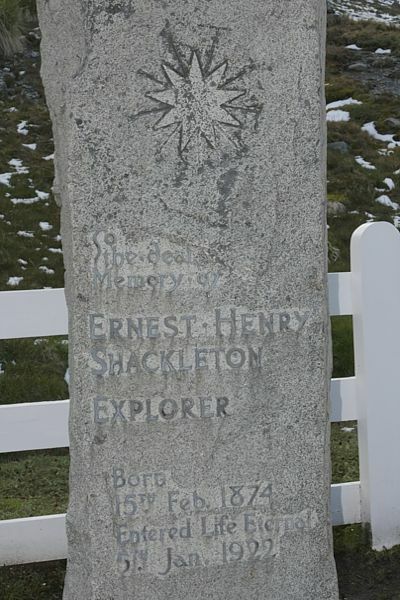 Before too long, South Georgia beckoned on the horizon. 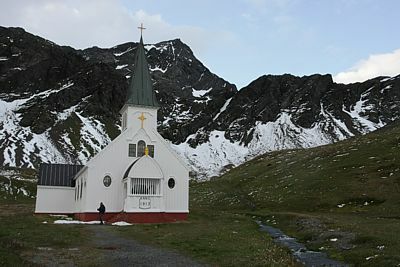 Although there was lots of low cloud, one could see the snow covered peaks of the mountains and it was a really impressive sight. 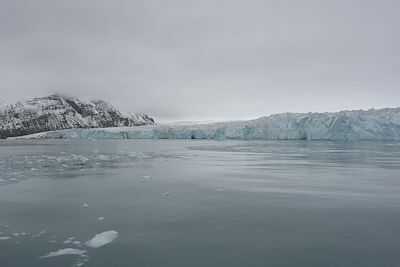 We made our way into Cumberland Bay and the captain steered the ship into the south-eastern corner of the bay where we were given an up close and personal view of the Nordenskjold Glacier from the ship. 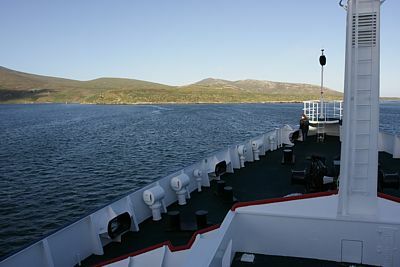 By now, all of those who had been "man down" for the last few days were feeling much better and were up on deck to enjoy the spectacular views. 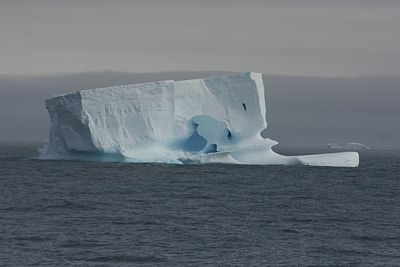 Already, we were starting to see different birds as well with Gentoo and Macaroni Penguins, Grey-backed Storm Petrel, Antarctic Tern, South Georgia Shag and South Georgia Diving Petrel all being added to the list. 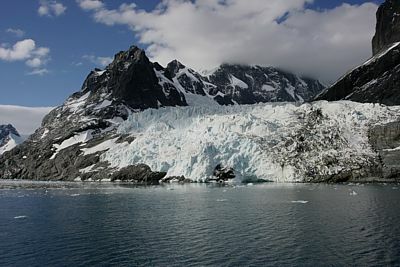 From here, we made our way across to King Edward Cove and, all the while, the weather was improving. 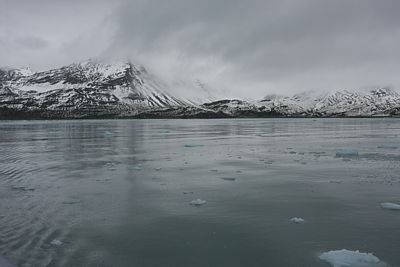 As we passed King Edward Point (the capital) and moved into the bay to anchor just off Grytviken, the clouds had started disappearing and the scenery was absolutely spectacular. 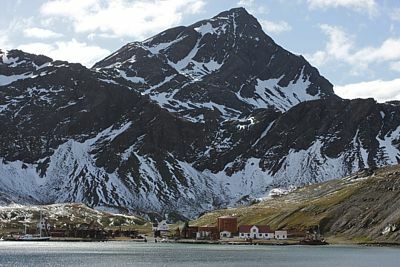 Grytviken is an old disused whaling station (used up until about 1960) and most of the buildings and storage tanks, etc. 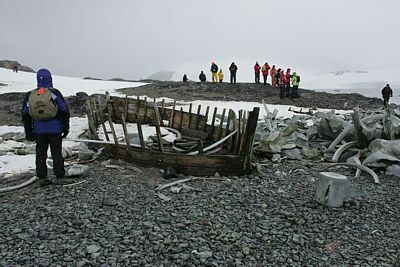 are still there as well as a few very run down boats. 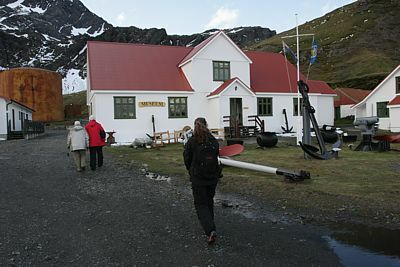 It also has a small museum, shop, post office and church as well as being home to the final resting place of Sir Ernest Shackleton. 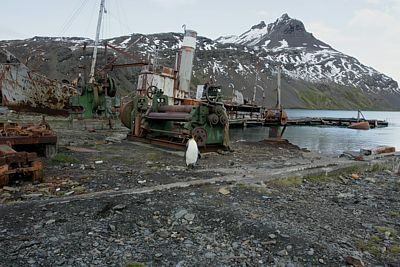 After finishing up with all the touristy things, we took a walk along the coast to King Edward Point. 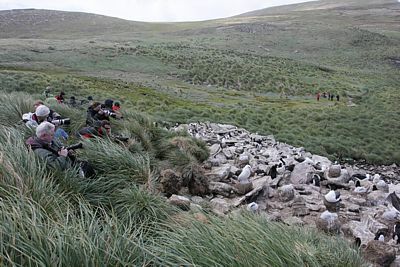 Lots more King Penguins and seals as well as reasonable numbers of Yellow-billed Pintails and Antarctic Terns (some even feeding very young chicks) whilst Greater Sheathbill was also a new addition to the list. 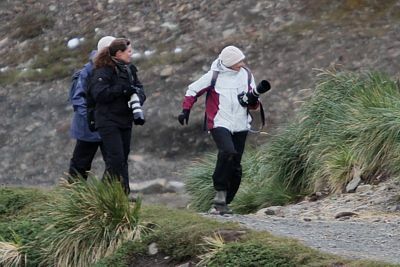 Flick even managed to get chased by an Antarctic Fur Seal on this walk. 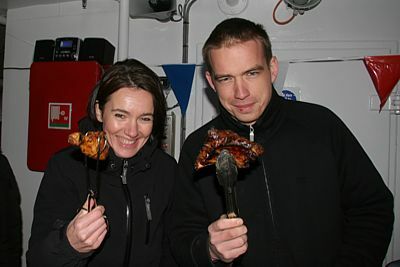 Eventually, it was time to head back to the ship where our chefs had prepared a barbeque for us. 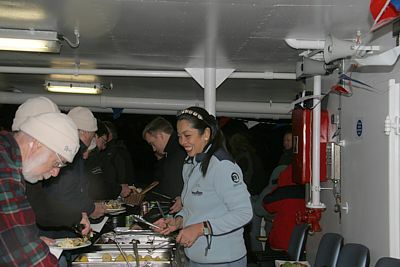 A novel experience having a "braai", as we call it in South Africa, just offshore of South Georgia. While sitting out on the back deck enjoying the good food and lovely South African red wine that they had provided for us with the meal, the wind came up so strong at one point that it literally blew the food right off our plates and everyone eventually had to move inside to try and finish off their dinner without having it disappear! 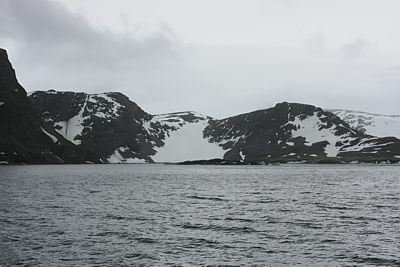 An early morning call from Rolf, the expedition leader, let us know that our proposed landing at Fortuna Bay was looking dubious due to high winds. 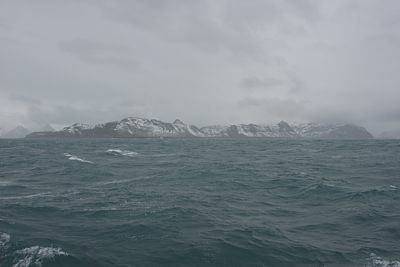 We sailed around Fortuna Bay for a little while keeping an eye on the wind speeds, but when it finally started gusting at over 35 knots, the landing was definitively called off. 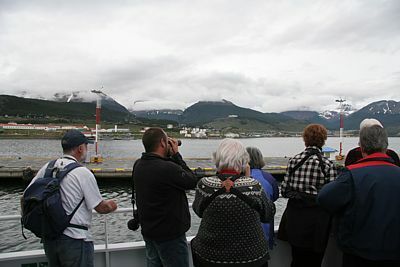 So our morning’s activity consisted of a ship cruise around the three main whaling stations in South Georgia. 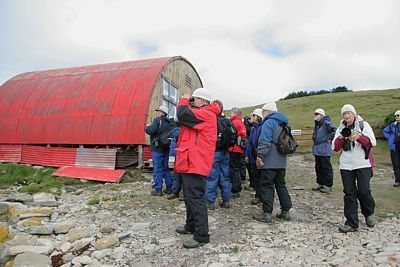 Our first station was at Stromness (the site of Shackleton’s rescue) where we were also able to see some of the Reindeer that have been introduced to South Georgia. 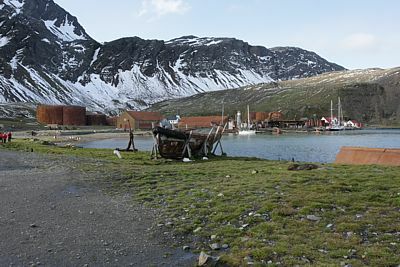 Then, it was on to Husvik and, finally, Leith, which was the biggest whaling station of it’s time housing some 400 people. 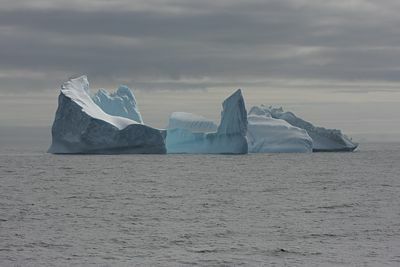 As the wind was still howling, after breakfast we carried on in a northerly direction and did another ship cruise into Antarctic Bay, headed by one of the many spectacular glaciers in the region. 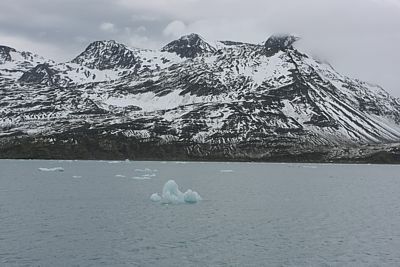 Heading around the corner, we cruised another Fjord, Posession Bay, where we saw the Purvis Glacier which lies just to the north of the famous Shackleton Gap. 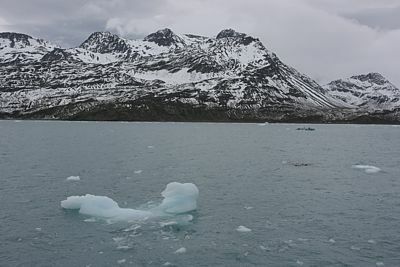 This is where Shackleton, Worsley and Crean came down the glacier and realised they were lost, so went all the way back up and continued south along the main divide. 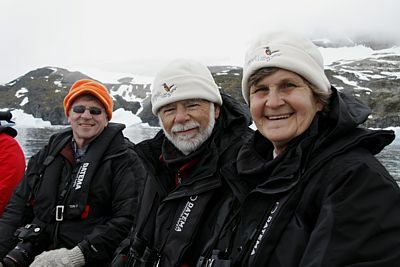 Obviously, the birding hadn't stopped and we were enjoying species like Northern Giant and White-chinned Petrels, Antarctic Prion, Gentoo and Macaroni Penguins and Wandering, Black-browed, Grey-headed and Light-mantled Albatrosses all along the way. 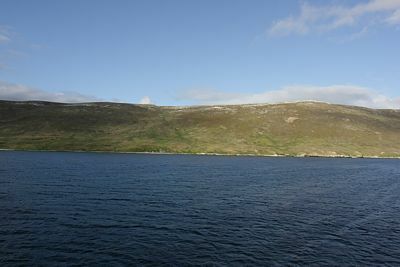 After lunch, we sailed into the Bay of Isles, where we cruised around Prion and Albatross Islands. 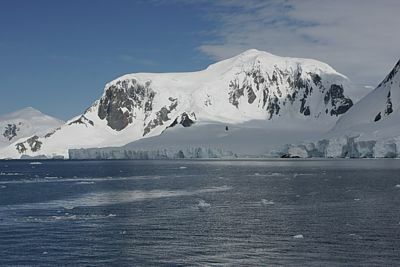 It was nice that, even from the ship, we could see the nesting albatrosses. 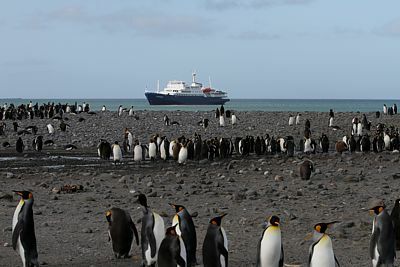 We admired the huge colony of several hundred thousand King Penguins at Salisbury Plain where we intended to land, but had to wait a few hours as the landing site was occupied by another ship. 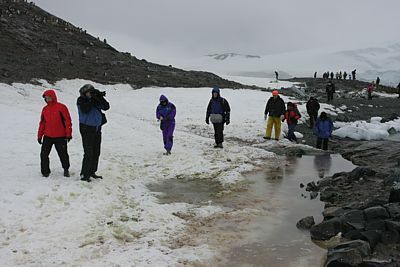 Finally, however, it was our turn and it was an exciting surf landing to get us onto the beach. 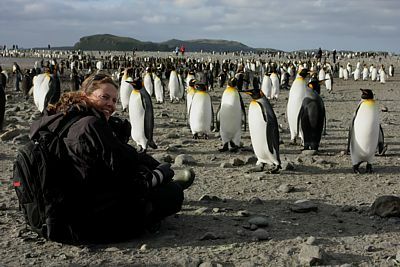 Once on shore at Salisbury Plain, the experience of being in amongst this huge colony of penguins was simply amazing and must rate as one of THE best wildlife experiences ever! 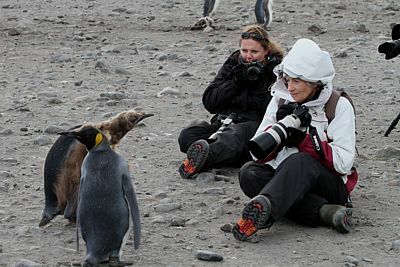 We spent the next 3 hours in the colony taking many gigs of photos of the penguins whilst there were also inquisitive Kelp Gulls and Subantarctic (Brown) Skuas to keep us entertained. 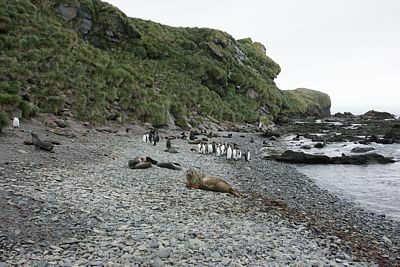 The area was also riddled with Antarctic Fur Seals, many with tiny pups as well. 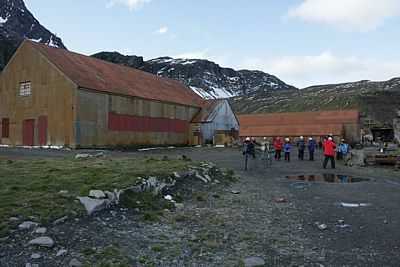 The 3 hours passed by so quickly that it was very disappointing to eventually have to make our way back to the ship, but what an awesome day! 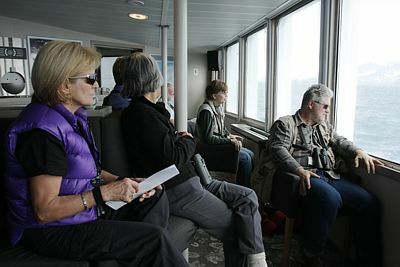 Spirits were still high in the observation lounge... ...as we continued to keep a look out for birds. 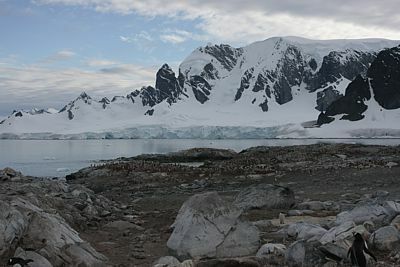 Up early this morning, we were just offshore of Cooper Bay and were treated to small numbers of Chinstrap Penguins in the water right next to the ship. 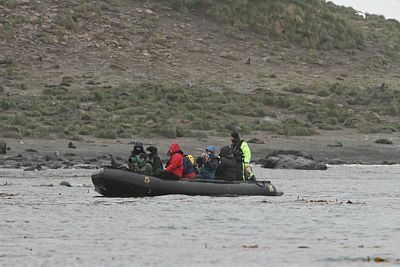 After breakfast, we made a zodiac landing on a small beach packed full of Antarctic Fur Seals and then hiked up a hill to a Macaroni Penguin colony. 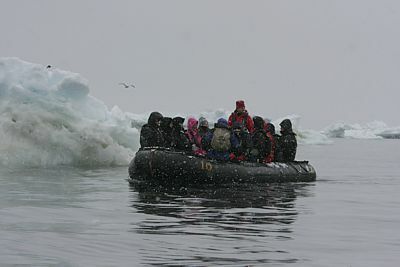 We had to take evasive action several times here with seals that were a little too unfriendly and started chasing us. 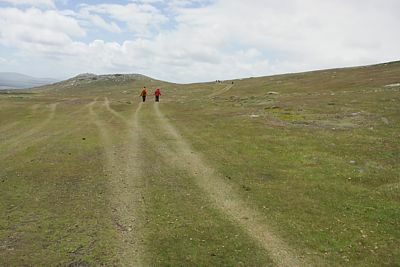 On the way up the hill, we were also very happy to finally connect with several South Georgia Pipits, the only true endemic of the island. 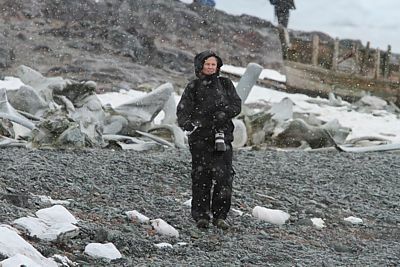 After spending some time at the Macaroni Penguin colony, we headed back down to the beach where, whilst waiting for the zodiacs to arrive, we also got to enjoy Gentoo and Chinstrap Penguins as well as Greater Sheathbills. 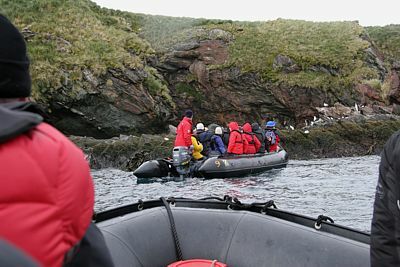 Once on the zodiacs, we took a cruise along the coastline getting in close to South Georgia Shags as well as also seeing Yellow-billed Pintails and King Penguins and many of the same species we had seen on land. 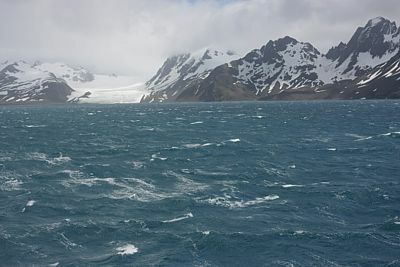 However, the weather turned very quickly and, before we knew it, the wind had picked up tremendously and the sea had also become very rough. 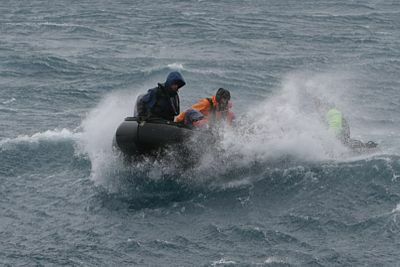 Being about a mile away from the ship meant that we had an extremely rough and wet ride back to the ship with everyone getting absolutely drenched right through. 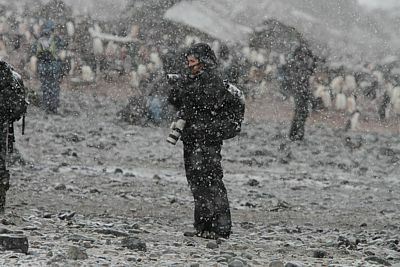 This also claimed the lives of many cameras who are not made to take this sort of exposure to salt water. 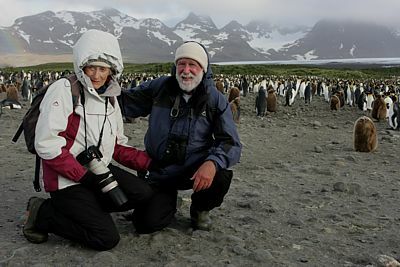 (Fortunately, both Margaret and I had spare camera bodies with us on this trip as we both lost one camera on this little excursion!) 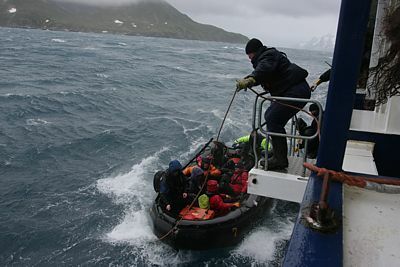 Obviously, the rough conditions made getting the passengers from the zodiacs on to the ship quite dangerous as well and our zodiac was the last one allowed to offload passengers. 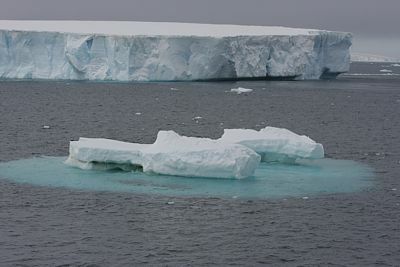 The captain then made a call that all the others should turn back and go to land. 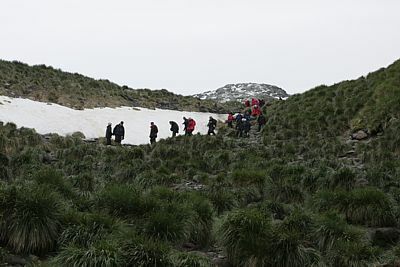 As the weather deteriorated and it started snowing, this did not help those who had to turn back as many of them were already wet right through. 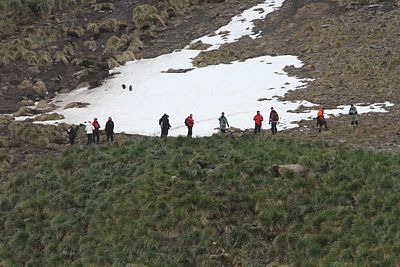 On shore, the staff did what they could to assist in keeping people warm, but there were a couple of cases of really bad hypothermia where slightly more extensive action had to be taken to assist the passengers. 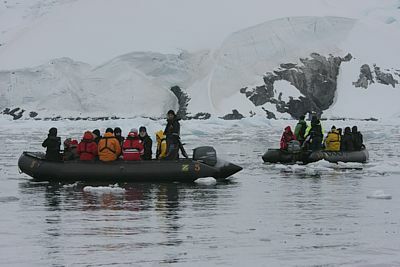 Obviously, all the zodiacs were equipped with the necessary survival gear and the staff still on land were therefore able to do what was necessary. 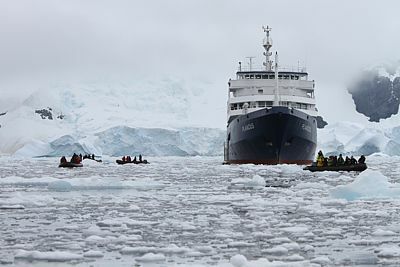 After moving the ship to a slightly more sheltered area, they then began to bring the rest of the passengers back to the ship and, although this was a fairly frightening experience, it all turned out fine in the end thanks to the experience of the staff. 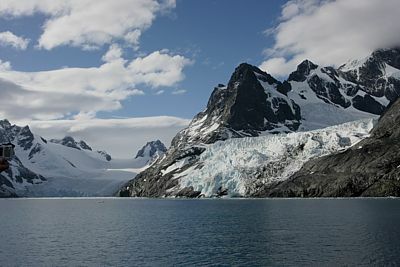 After everyone was back on board and had had nice hot showers to warm up and some lunch, we headed off and, before too long, were entering one of the most scenic parts of South Georgia, Drygalski Fjord. 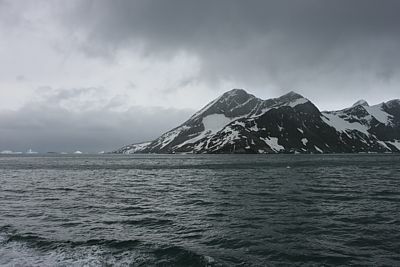 We headed up the fjord and, as we did so, the weather improved dramatically till eventually, it was bright sunshine again. 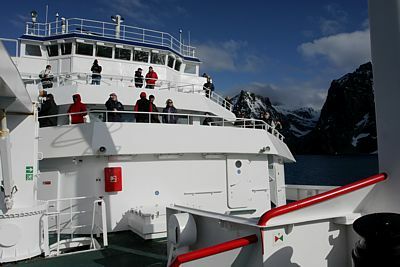 This was a truly spectacular part of the island and, once again, most passengers were on deck again taking lots of photos (well, those that still had cameras anyway!). 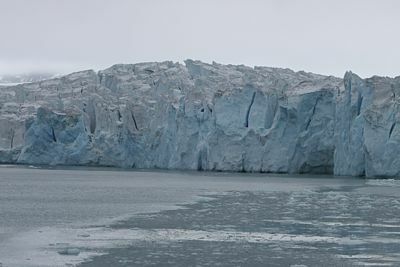 At the top of the fjord, we were once again afforded close up views of one of the glaciers. 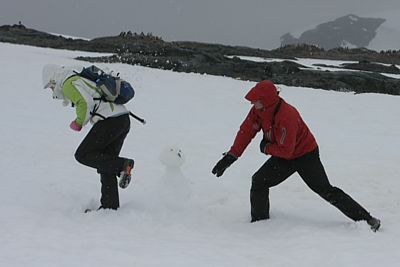 What made this even more awesome was that we had our first Snow Petrels of the trip flying around here as well. 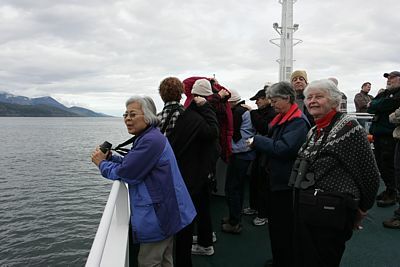 Eventually, we turned around and headed out of the fjord around the corner to Cape Disappointment and finally leaving South Georgia behind, a fantastic end to a very eventful day. 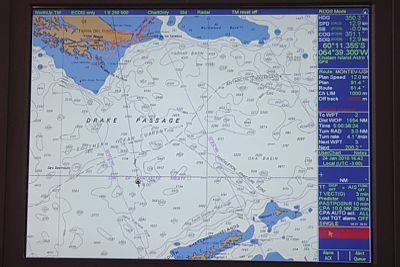 Today was spent entirely at sea heading southwards. 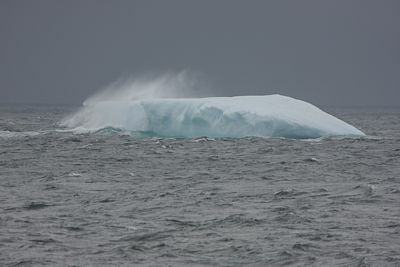 Weather was reasonably good with not much wind and a fairly calm sea and outside temperature reached a maximum of 4 deg C. Many hours were spent scanning the open ocean which turned up Northern Giant, White-chinned and Cape Petrels as well as more Snow Petrels. 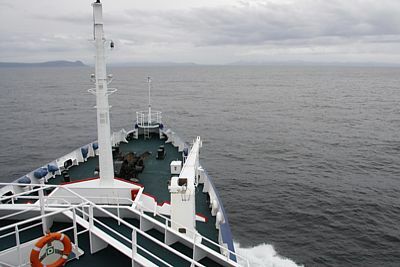 We were also lucky to spot the first Blue Petrels of the trip and also had a couple of very friendly Kerguelen Petrels visit the ship. 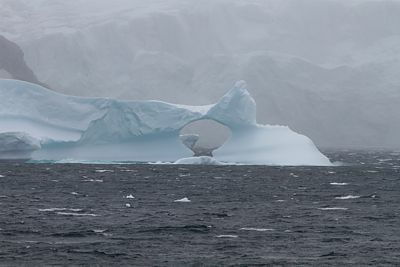 Other species encountered again included Wandering and Black-browed Albatrosses, Wilson's and Black-bellied Storm Petrels and Antarctic Prion while there were also good numbers of Fin Whales as well as a few Sei Whales seen during the day. 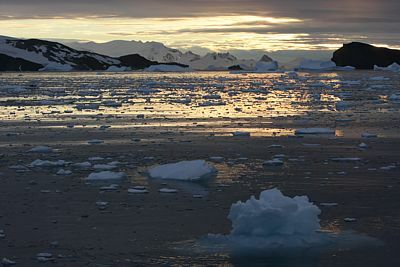 Up early this morning, we were greeted by the South Orkney Islands on the horizon. 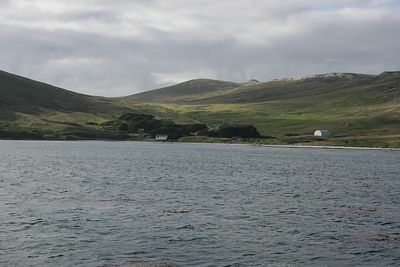 Although it was our intention to land here, the weather was not great with a totally overcast sky and strong winds gusting upwards of 50 knots at our proposed landing site, so unfortunately, we had to cancel any possible landings at the islands. 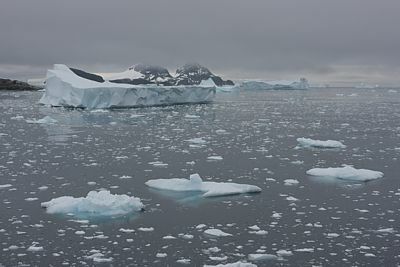 However, cruising around the islands still provided some spectacular scenery with the likes of Antarctic Terns, Light-mantled Albatrosses and Snow Petrels flying around us. 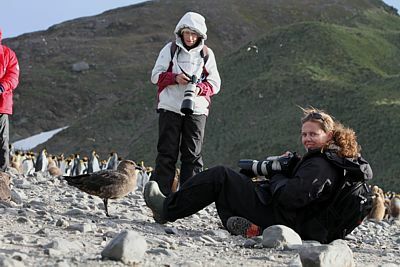 We also recorded our first Antarctic Shags of the trip here. 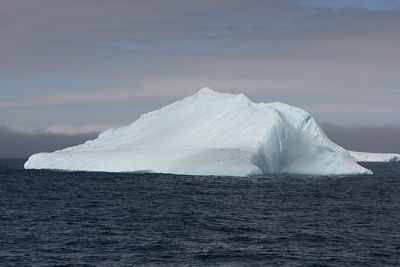 Eventually leaving the islands, we continued to head south throughout the rest of the day with several large icebergs encountered along the way (one of them was enormous totaling about 6km in length!). 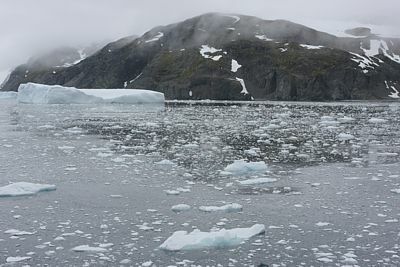 Although most of the same species were encountered as before, the latter part of the day added a few new ones including Southern Fulmar and Antarctic Petrel. 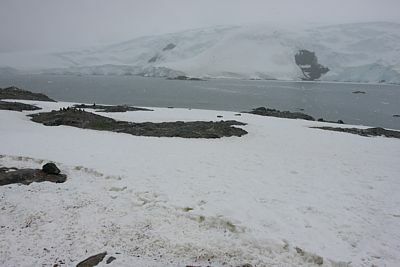 Waking up early this morning and stepping out on to the deck, it was evident very quickly that we were now well and truly in the Antarctic even although there was not actually any land in sight. 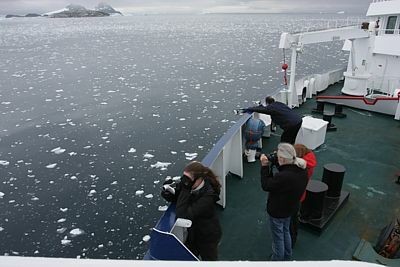 However, there was ice everywhere and the cameras started rolling with the literally hundreds of icebergs all around us. 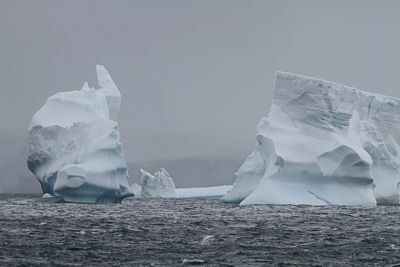 Needless to say, there were some nice birds around as well and the morning shift turned up Cape, Antarctic and Snow Petrels, Southern Fulmar, Wilson's and Black-bellied Storm Petrels and Chinstrap and Gentoo Penguins amongst others. 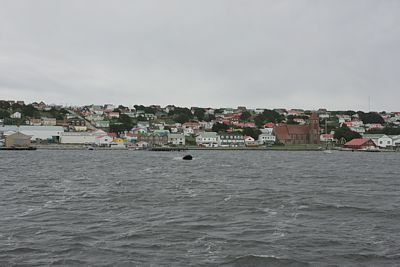 Several Humpback Whales were also seen during the course of the morning. 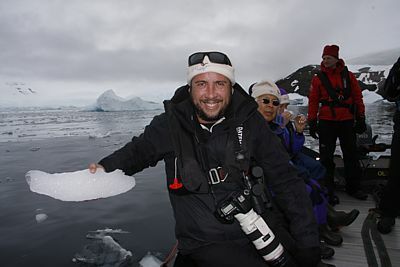 The afternoon produced most of the same species and by dinner time, we had reached Petrel Cove and Dundee Island in Antarctica proper. 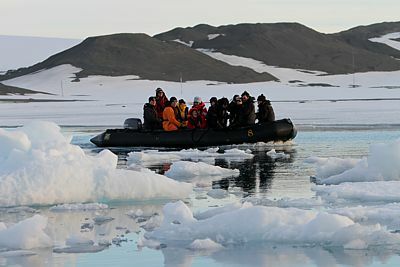 It was a bit of a surprise to us all when they announced that we would be making our first zodiac cruise straight after dinner. 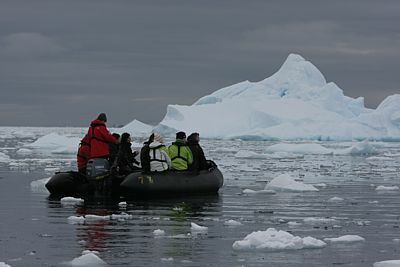 So, after excitingly donning all the necessary gear, we were all out in the zodiacs cruising in amongst the ice and enjoying the absolutely spectacular scenery. 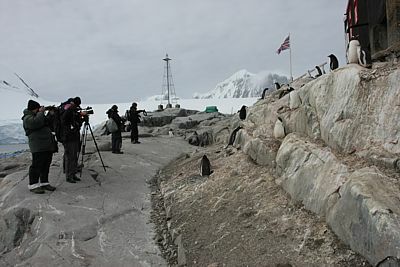 Small groups of Adelie Penguins were a welcome distraction as well as both Weddell and Crabeater Seals lazing about on the ice. 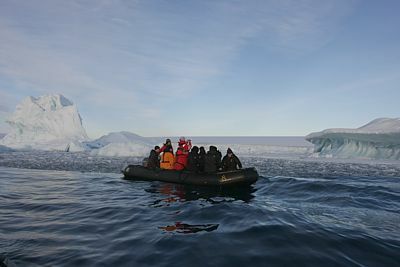 It was almost surreal to be out on a zodiac experiencing our first Antarctic sunset and it was with heavy hearts that we eventually returned to the ship and headed off to bed excited about what lay ahead for tomorrow. 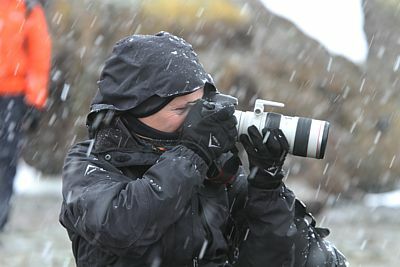 Up early this morning and the weather had changed somewhat. 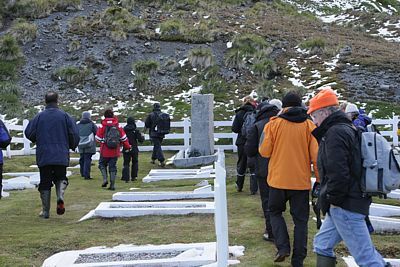 It was -2 deg C outside with a light breeze and continuous snowfall, but we were due to set foot for the first time on the continent at a place called Brown Bluff and nothing was going to stop us. 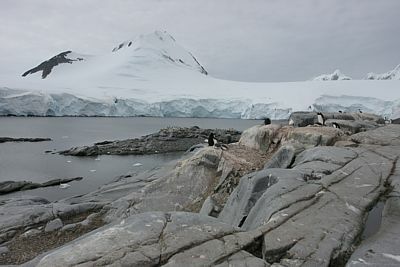 Once ashore, we were treated to a large colony of Adelie Penguins as well as reasonable numbers of Gentoo Penguins in between. 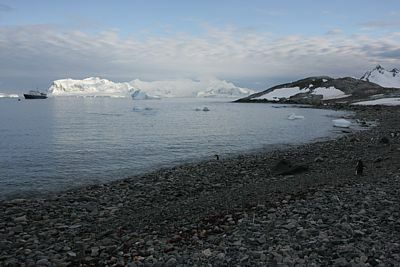 There were also Southern Giant Petrels, Kelp Gulls and Antarctic Terns around. 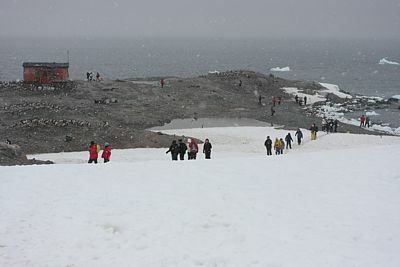 We spent the next couple of hours getting snowed on and taking lots of photos in the penguin colony before eventually returning to the ship. 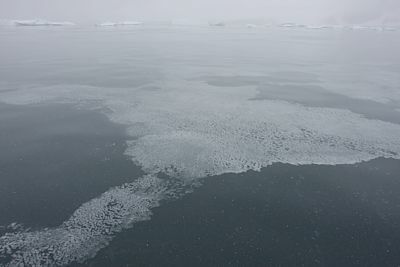 One could tell just how cold it actually was as there was lots of grease ice on the water, the first stage in sea ice formation. 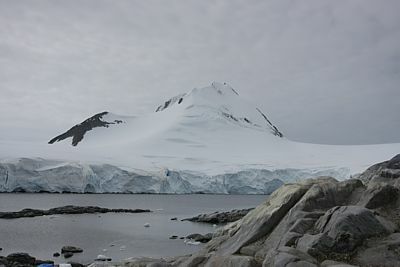 The afternoon saw us heading off to Paulet Island once again seeing several Weddell and Crabeater Seals along the way as well as some Antarctic Shags. 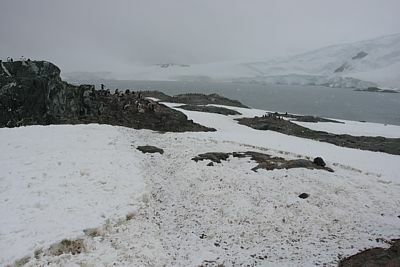 Weather conditions were still not great, but we were here to see one of the largest Adelie Penguin colonies. 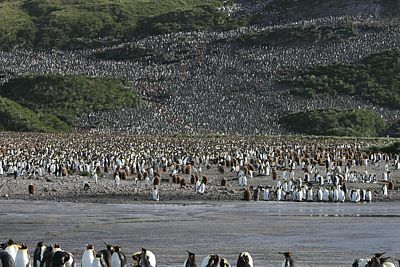 In fact, there were so many penguins here that we couldn't actually land where we wanted to because the beach was too full of penguins. 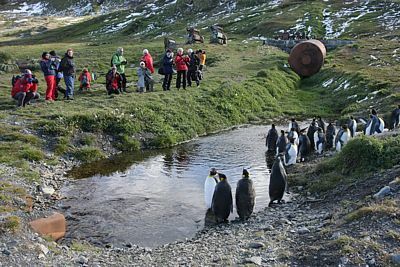 We had to move around the island and land at a different site where there were less penguins on the beach. 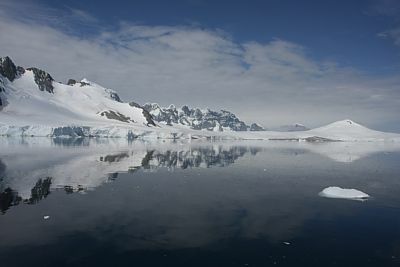 After spending some time here, it was eventually time to head back to the ship after another eventful day with many of us having set foot on the white continent for the first time! 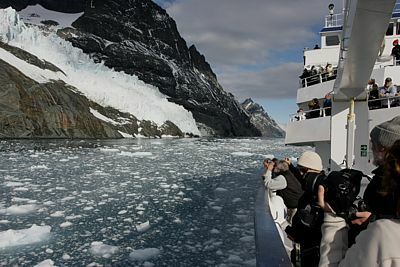 Back on the ship and after lunch, we made our way towards Cierva Cove. 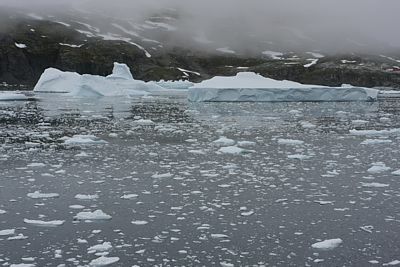 Entering the area, we were excited to find many Leopard Seals lazing around on the ice, many of them having just recently fed which was evident by the blood stains on the ice! 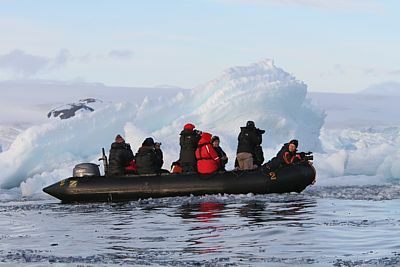 An afternoon zodiac cruise in amongst the ice was really special with Antarctic Terns and South Polar Skuas all around us as well as really close interactions with Antarctic Minke Whales which were surfacing right next to our zodiacs and giving us incredible views. 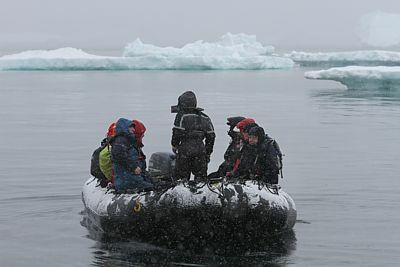 Obviously, we were also able to get up close and personal with the Leopard Seals as well as several Crabeater Seals also hauled up on the ice. 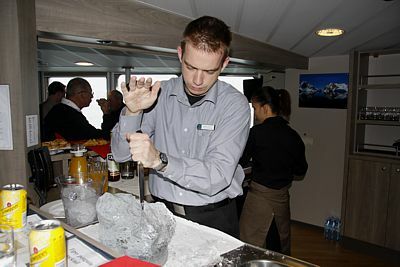 Once back on the ship, one of the guides, Jordi, had grabbed a few pieces of ice and brought them back on board and into the bar where the restaurant manager, Francis, got to work on them with a knife to break them into smaller pieces to put into people's drinks. 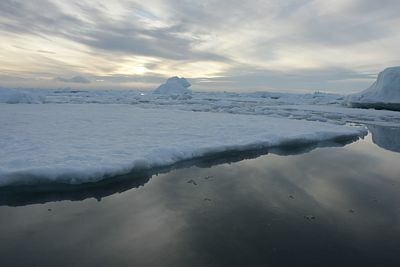 Clearly, this went down a treat with everyone wanting a drink with real Antarctic ice in it! 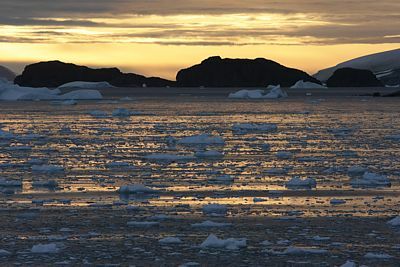 We remained anchored in the cove for some time and got to experience another awesome Antarctic sunset. 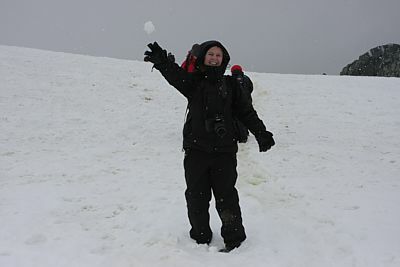 Margaret releasing the snowball... ...and just before the final "splat"! 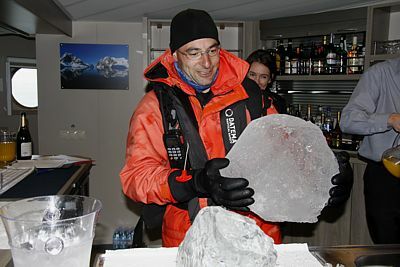 Jordi brings some ice for everyone's drinks... ...and Francis gets to work on it. 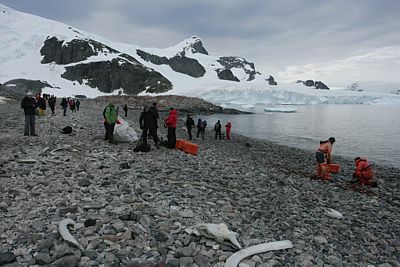 It was an early start this morning and, by 6am, we were already ashore at Cuverville Island. 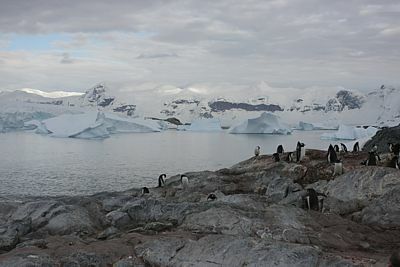 Again, there was a large colony of Gentoo Penguins here with the odd Chinstrap Penguin in between. 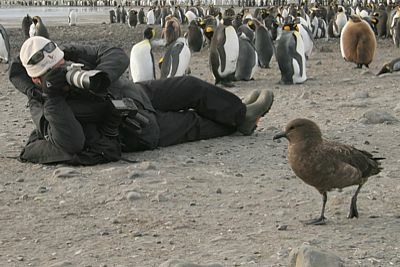 We also had many South Polar Skuas around, several of them being very inquisitive and coming right up to us and pecking on our boots and clothing. 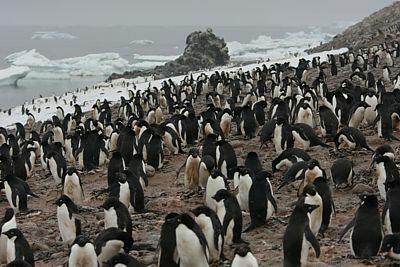 The only other species around were Kelp Gulls and Antarctic Terns. 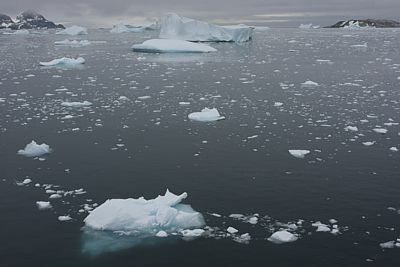 By 9am, we were back on board and headed off to our final destination on the continent. 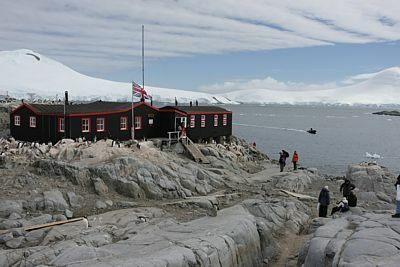 After cruising through the absolutely stunning Neumayer Channel, we eventually arrived at Port Lockroy, a British Antarctic Survey Station. 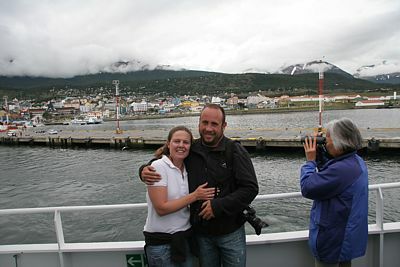 At about 3pm, we were eventually all back on the ship to start our long trip back to South America. 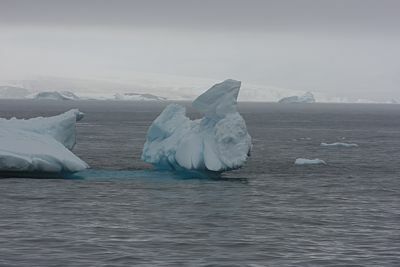 We once again passed through the Neumayer Channel and out through Dallman Bay where we were sent off on our way by a friendly pod of Humpback Whales. 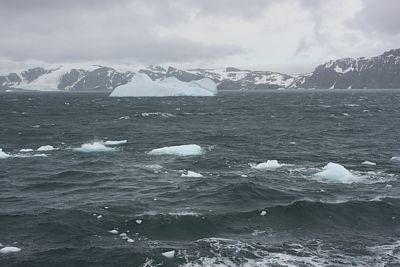 Before long, we were heading out into the open ocean and the first Black-browed Albatrosses joined the ship as we all looked back and watched the white continent disappear in the distance. 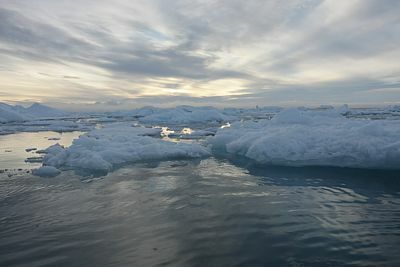 Waking up this morning, we found ourselves crossing the Drake Passage with absolutely flat calm seas and bright sunshine. 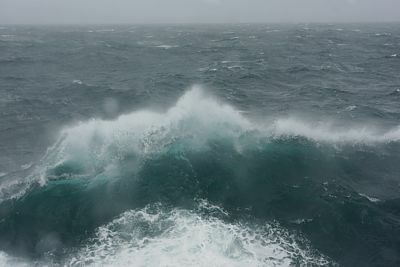 The Drake Passage has a bit of a reputation for really rough seas and was certainly not living up to this today. 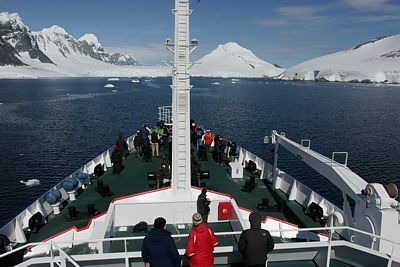 The early part of the day had many Antarctic and Cape Petrels, Southern Fulmars, Antarctic Prions and Light-mantled Albatrosses around the ship whilst, as the day progressed, we started seeing Wandering, Southern Royal and Grey-headed Albatrosses, Wilson's and Black-bellied Storm Petrels and Subantarctic (Brown) Skuas amongst others again. 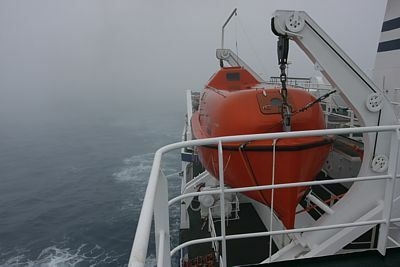 Many hours were once again spent on deck scanning the ocean, but no new species were added to our list today. 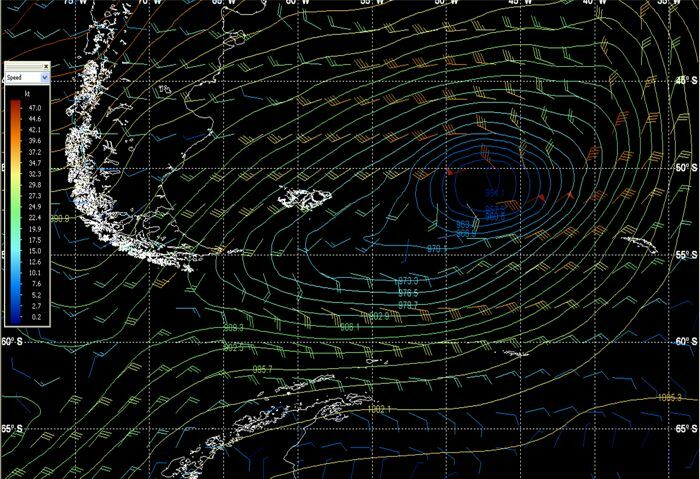 This morning, things had changed a bit and the Drake Passage was suddenly living up to its reputation with some really rough conditions. 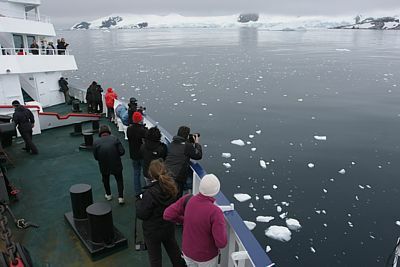 This was noticeable by the obvious drop in the number of passengers that were up and about on the ship. 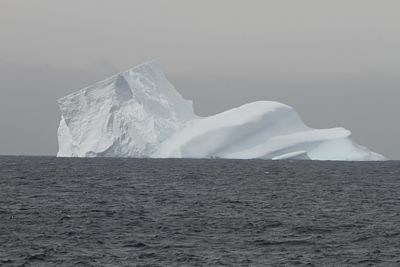 Scanning the seas throughout the day turned up Southern and Northern Giant, White-chinned and Soft-plumaged Petrels, Wandering, Southern Royal and Black-browed Albatrosses and Sooty Shearwaters again. 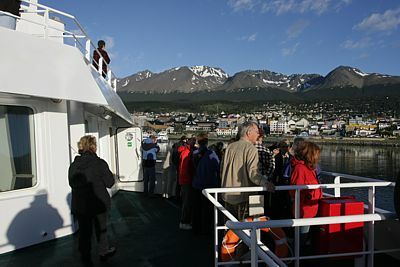 By late afternoon, we had reached the mouth of the Beagle Channel and the conditions had calmed down considerably meaning that there were suddenly a lot more passengers on deck. 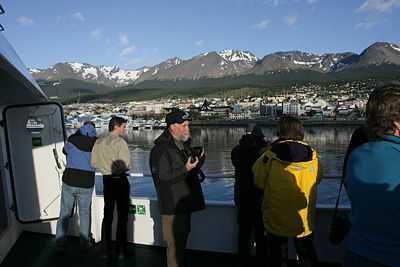 The early evening in the Beagle Channel produced King Shag, Magellanic Penguin and South American Tern whilst a group of Killer Whales also caused excitement and some Peale's Dolphins were an added distraction. 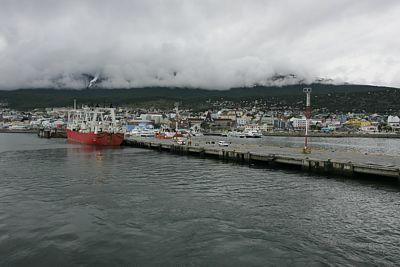 Our last evening aboard was spent anchored just inside the mouth of the channel for a few hours before lifting anchor and completing the last stretch to Ushuaia. 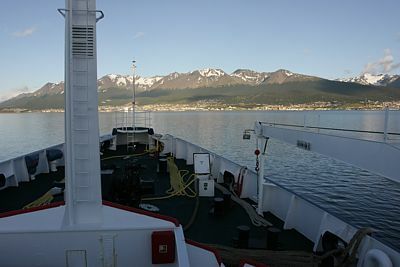 Rising early this morning, we found ourselves heading into Ushuaia. 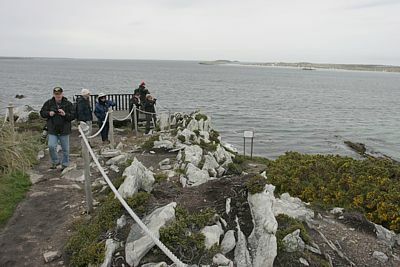 There was still some time for some last minute birding seeing things like Southern Giant Petrel, King Shag and Kelp and Dolphin Gulls. 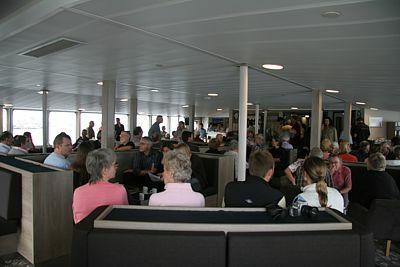 After breakfast in the dining room while docking, it was then time to say our final good-byes and head our separate ways. 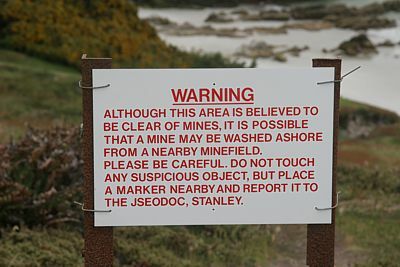 What can one say about visiting these areas? 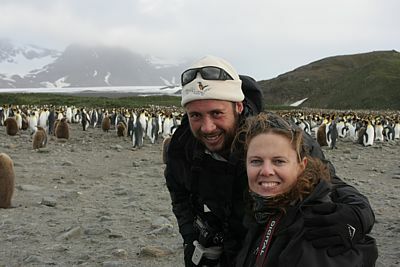 We felt truly privileged to be able to get there as it is a place that I have always dreamed of visiting. 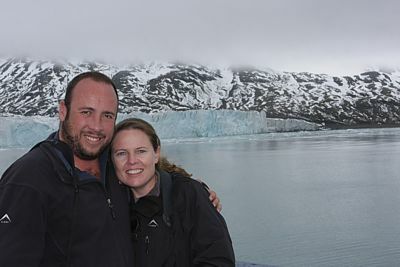 The only negative of the whole trip was that, at times, it would have been great to spend more time in certain areas to really take them all in, but it was still an incredible trip. 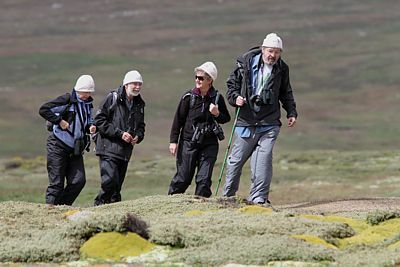 One doesn't go on these trips to amass huge trip lists, so we were reasonably satisfied with our meagre bird list of 75 species whilst 16 mammals seemed like a reasonable haul too. 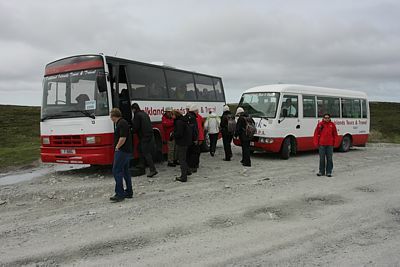 Please click on the link below to see our full trip list as well as links to photos of many of them.